My x360 notebook with Windows 10 works fine. I just installed Linux dual boot (w. Windows 10) on three new partitions. The partitions are as below. Partitions E, F, G are Linux. 2. Is it safe to remove the recovery partition (D)? 3. There is also a small 980 MB partition. What is this? Is it safe to remove? My guess is that your PC did not come with Win10 preintalled, but instead, you Upgraded it to Win10, right? Once you did that, any existing HP Recovery partition and functions got broken and would not work anymore. Once you have that backup, you can remove ALL the recovery partitions and reclaim the disk space. I bought my PC recently with Windows 10 preinstalled. I then added Linux. I used Norton Ghost for image backup on an older computer. I have used Acronis on a pure Windows computer. But for this combined Windows/Linux computer Acronis does not work, it works forever on the Linux partitions and is not useful. I have not tried Macrium Reflect. I dont know if it works on LInux file system. Sorry, no. You can not recover using the HP Recovery partition after you've changed the partitioning scheme. Since it serves no purpose now, you might as well remove it. It will do no harm to remove it now because the HP Recovery function doesn'y work anyway. I know Macrium Reflect can backup and restore both Windows and Linux distros because I have tried that, myself. Thanks for good advice on Macrium Reflect. It seems to work well on both Wndows and LInux partitions. Quick and good compression. I think it was also free, not just a test version. I have installed 3 Ubuntu partitions (E, F, G in the screenshot below). The computer now runs dual boot Windows 10 and Ubuntu 16.04. 1. Is the 0.98G partition the HP recovery partition? 2. 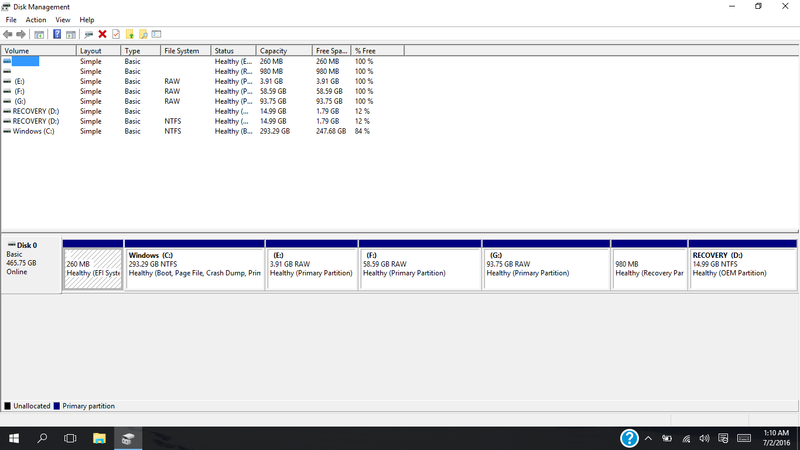 Is the 14.99G partition the Windows recovery partition? 3. Can any of these two partitions be useful now that the computer is already repartitioned for LInux/Windows? To use Macrium Reflect, if you have made a boot USB/CD from that, you boot using it and then run the app to select the restore you made. I don't know about the Windows image as I do not use Windows built-ins to do backup or recovery. You can remove both of these partitions, as repartitioning for Linux has effectively made them useless.